"Turek" redirects here. For other uses, see Turek (disambiguation). Turek zawsze po drodze / Miasto silne jak tur. 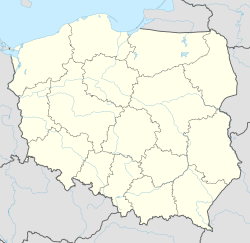 Turek [ˈturɛk] is a town in central Poland with 31,282 inhabitants As of 2009[update]. It is the capital of Turek County. Turek has been situated in the Greater Poland Voivodeship since 1999; it was in Konin Voivodeship from 1975 to 1998. Turek is first mentioned in the historical record 1136, when it was listed as belonging to the archbishops of Gniezno. It received its city rights in 1341. The town was the capital of a district within the Kalisz region of the Russian Empire. Following the end of the First World War in 1918, Turek became part of the Second Polish Republic. With the German invasion of Poland and the outbreak of the Second World War, Turek was occupied by the Wehrmacht and annexed by Nazi Germany. It was administered as part of the county or district (kreis) of Turek within Reichsgau Wartheland. With the arrival of the Red Army in 1945 and the end of the war, Turek was integrated into the People's Republic of Poland. ^ "Kalisz". In Encyclopædia Britannica. Volume 15. p 642. Accessed via Google Books 10/6/11. Wikimedia Commons has media related to Turek. This Greater Poland Voivodeship location article is a stub. You can help Wikipedia by expanding it. This page was last edited on 18 November 2018, at 22:33 (UTC).